Oh the tedium of thinning carrots! We use a Jang seeder, but since we can’t get consistent germination I usually just dump thousands of seeds like you and then thin them later. I’d really like to try a new plan for next year, much off season planning to get this carrot thing better. eric: Yeah, the germination thing. That’s exactly why I still use the Earthway for carrots. An approach I heard about and have been meaning to try for years is using the Earthway and cutting the seed with something same-sized and inert. Like, get the cheapest possible carrot seed and bake it. Then experiment with different ratios of viable to dead seed. I think I’d start with 30:70, 20:80, and a little 10-90. There’s probably even time to try it out this season! Asking around online might turn up someone who’s already perfected this, because I did read about it somewhere. I’m really keen on that tip about cutting the carrot seed with some dead carrot seed. You could consider setting aside 10 or 15 carrots each season to go to seed, do they flower in their second or first year? I can’t recall. Another method I remember is to chop the top off of a carrot you are using in the kitchen and place the top half on some wet kitchen paper, it will develop roots from the bottom and start to shoot again, when you transplant it out it will definitely flower. The last time I collected fresh carrot seed (nearly 10 years ago now) I remember getting quite a bit from a few flowers. Would have to possibly be the cheapest source in my mind. Now I just need one of those bloomin’ seeders. Here’s my simple system: Get a good seed guide, or just read the back of the seed pack. It will tell you how many feet of row a given amount of seed will plant. Mix the seed into some fine sand or dust. I usually put a packet of seed into a quart of fine river sand. Fine. Next, I punch big holes into a canning lid/flat. Screw that onto the quart jar, and go to the garden. When your row is prepared, marked out for correct distance, and ready, tip the jar upside down, and let the sand/seed spill onto the ground as you walk the row. With a little judgment and good eye, you can make the sand come out right. If you hit the end of the row and still have sand left, turn around and go back over until the sand/seed has run out. Results: Nearly perfect distribution every time. Not mechanical, and not ‘precise’ but very effective – and cheap. Eating one raw carrot a day preferably in the morning can bind to endotoxin in the gut and improve your health. Try to add some vinegar and a little bit of olive oil to make it tasty. Many say they do not eat organic products that are safe, that do not meet the health situation, but really have no idea that the origins of any vegetable, fruit, etc.. was that, organic., I feel good and my family when we eat organic vegetables. greetings. I love your blog!! Great blog about Carrots!! These carrots are very well thinned out for maximum growth for the stalks that are left!! This shows the importance of how carrots should be thinned. Another great post :) Thanks finyfarm. Hey Chloe, it’s easy! Water in your carrots before covering them. The cover then takes care of keeping the bed wet, so you shouldn’t have to water again until germination. Check back starting in about 7 days. You’re looking for tiny, hair-thin little green seedlings to start popping up. Once they start, they may all come up immediately, or it could take a day or two for a nice even line to appear, so decide if you want to wait, if so, check back daily for that day or two until you like what you see! Then, off comes the cover and you should be set. The seedlings don’t need to be hardened off to adjust for the full sun. 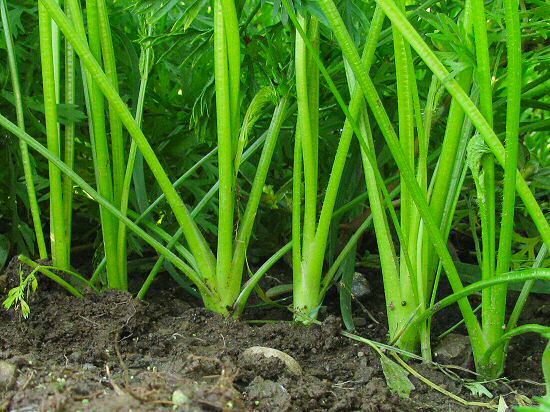 But if you start carrots in mid-summer, when the sun is high and hot, after uncovering, you’ll probably have to water them daily for a couple of days at least, so they won’t dry out. You should recognize when they’re off and running, they’ll kinda start to look…sturdier, in a tiny way, after a bit of full-sun exposure.